The Danish Way of Parenting: What the Happiest People in the World Know About Raising Confident, Capable Kids by Jessica Alexander and Iben Sandahl inspires me and I highly recommend it as an excellent resource for parents. Because why are the Danes always rated so happy and how does their parenting raise happy kids that become happy adults anyway? The authors, a Danish psychotherapist and a writer mom married to a Danish man, looked at the Danish philosophy of parenting and noticed a pattern from which they created a helpful acronym and by which the book is organized. The authors are very clear that parenting alone is not the only factor in why Danes are so happy and nor is Denmark a utopia. However, they wanted to look at the foundational parenting beliefs that have worked for Danish parents over the years. I love the suggestions in the book for each of the PARENT words. I’m not going to rewrite the book here but I do want to give you a glimpse into is covered and why I like it so much. First, kids must play. Play, as you probably know, is the primary way a child learns. Play builds resilience which leads to emotional regulation and more ability to cope with stress. I could go on and on about all the research here — there’s A TON. Suffice to say that in Denmark, unlike the States (my comparison not theirs) people actually let their kids play and don’t over schedule them. Brilliant! In fact in Denmark, play is so important that children under ten years of age finish regular school at 2 p.m. after which they can go home or choose to go to “free-time school” where they are encouraged to play. Many schools also have a program called Play Patrol where the older elementary students facilitate playful activities for the younger ones such as hide and seek, firefighter, or family pet. It’s also important to mention that when children play, Danish parents give them space to learn and take risks and grow. In other words, they don’t intervene unless absolutely necessary. For instance, parents wouldn’t carry their child over a log but might provide a finger to help the child balance enough to get over himself. This emphasis on play is, in my estimation, is sound parenting advice. The next Danish parenting trait is authenticity. Authenticity is knowing one’s self, being aware of your own emotions. It sounds easy. It’s not always. Let’s take me, for example. The first 39 years of my life I thought I knew my emotions, in fact I intellectualized about my emotions a great deal with books and in talk therapy, but I never actually FELT my emotions. (I never cried!) This happened growing up with a narcissistic parent where emotions were not safe to feel. I share because as I’ve finally stopped stuffing feelings and started feeling them, now I deeply understand the importance of being authentic first to myself and then with my family. The impact on my parenting is significant. I’m not just a better parent because I’m feeling but I see a trickle down effect with my kids’ ability to know and feel their own feelings. In this section, the authors also share about growth mindset which you can read more about here. Our Brain Highways classes recently focused on this quite a bit in the homework and wow is it important! Reframing is about shifting the language we use to reshape our thoughts and feelings and it’s the next characteristic of Danish parenting. The authors share the reframing as choosing to focus on the good instead of the bad. Being a realistic optimist. Many people, the authors explain, don’t really know what empathy is. I’ve read that many of us confuse empathy with sympathy. “Empathy is the ability to recognize and understand the feelings of others” and it’s essential in building relationships. Parents can help children develop empathy with guided conversations, modeling empathy for others, being deliberate about the words we use, being vulnerable ourselves, as well as reading books together that encompass all emotions. I skimmed this chapter because I’ve never been a fan of ultimatums. However, if you’re wondering, this chapter is about parenting with respect and not getting into power struggles with your children. The authors differentiate between four basic parenting styles: authoritarian (Tiger Mom), authoritative (the Danish), Permissive, and Uninvolved. It’s very interesting and helpful. Hygge (pronounced “hooga”) means “to cozy around together.” Danish families hang out — they light candles, play games, eat meals, sing, and just generally spend a lot of time together. Hygge is important to Danes because feeling connected to others “gives meaning and purpose to our lives.” True, right? 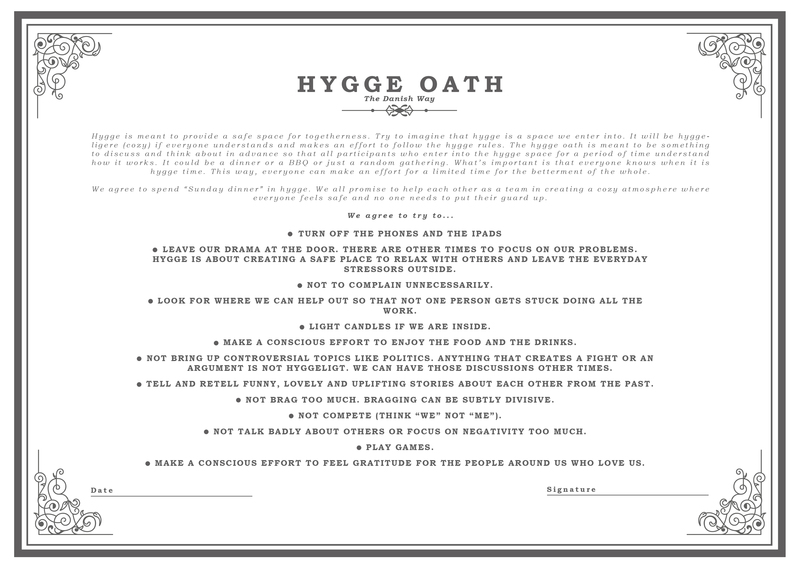 If you want to try hygge with your family, you can read & print out the Hygge Oath here. The Danish Way of Parenting makes sense to me. It’s all about emotionally healthy parents investing deliberately and respectfully in the lives of their children. This book will make you think and, I hope, inspire you. Maybe it will make you want to be more like a Danish parent. Are you already doing some of these? What do you want to incorporate into your parenting? You can catch up with the authors and read more about the book on the Danish Way website. This book is on my list! Thank you for this article! I started to read it yesterday. The premise speaks to me. I’m looking forward to read the rest and see how it could improve how I raise my son.